iTestMic is the most affordable way to have a calibrated SPL Meter, RTA, FFT analyzer and more. 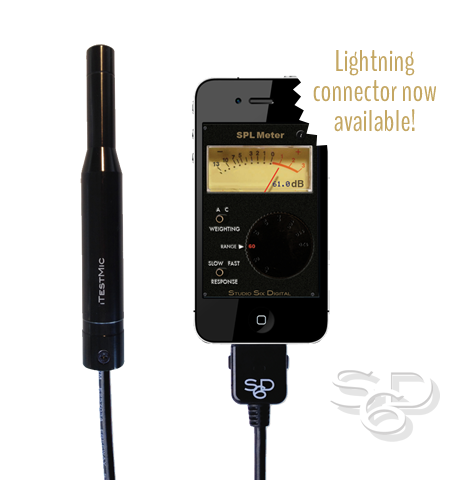 Plug it into your iPhone, iPod touch, or iPad to get a mobile professional test & measurement system. Please contact us for UK next-day delivery or EU delivery options. iPhone 5, 5C, 5S (6 and 6 Plus approval pending), iPad Mini, iPad Air, iPod Touch 5. Factory calibration stored internally, from a 94.0 dB pressure-compensated calibrator. The AudioTools app includes everything you need for measuring sound levels including spectrum analysis and FFT. Upgrade your app with extra modules when you need them. Use iTestMic with the AudioTools Wireless app for remotely sending microphone audio to AudioTools running on another iOS device. Download audio and data files easily through a web browser using any computer connected to the same network. Alternatively, download using Apple's iTunes software. When you plug iTestMic into any iOS device running AudioTools, the factory calibration values are read and applied, giving you an instantly available accurate SPL measurement tool calibrated to +/-0.1 dB, no matter what iOS device you are using. iTestMic meets ANSI / ISO Type 2 specifications for frequency response, linearity, and directional characteristics. Studio6Digital do not guarantee that this microphone can meet the strict environmental requirements of Type 2 or Type 1. An external power supply is not necessary to use the iTestMic. It will run from the battery of the iDevice that it is connected to. There is currently no option for connecting to external power with the Lightning model. This device consumes less than 50ma when in use. MAS ENVIRONMENTAL LTD is registered in England and Wales. Reg no 7501856.